Conventional shaped charges are constructed with a charge case, a hollow conical liner within the case, and a high explosive material positioned between the liner and case. A detonator is activated to initiate the explosive material to generate a detonation wave. This wave collapses the liner and a high velocity metallic jet is formed. The jet pierces the well casing and geologic formation, and a slow moving slug is simultaneously formed. The jet properties depend on the charge shape, the energy released, and the liner mass and composition. A Monroe-effect shaped-charge warhead can be expected to penetrate armor equal to 150-250% of the warhead diameter. Hydrodynamic penetration is a complex mechanism which begins to appear when the strike velocity exceeds a critical value, typically about 1,150m/s for current penetrators against rolled homogenous armor (RHA) targets. Full hydrodynamic behavior does not occur until the strike velocity reaches several kilometers per second, such as occurs with shaped charge munitions. At strike velocities less than about 1,150m/s penetration of metal armor occurs mainly through the mechanism of plastic deformation. 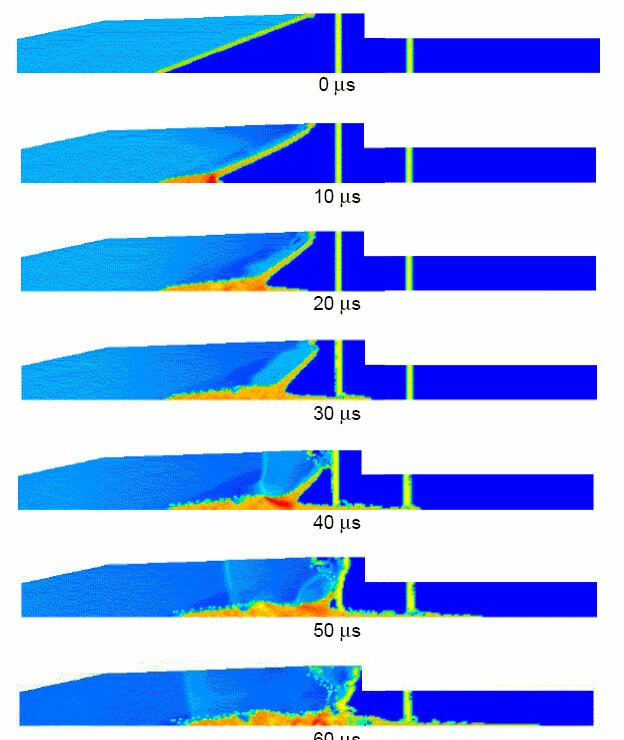 A typical penetrator achieves a strike velocity around 1,500m/s to 1,700m/s, depending on range, and therefore target effects generally exhibit both hydrodynamic behaviour and plastic deformation. A number of models of varying degrees of complexity have been developed to predict long rod penetrator performance. A common feature that emerges from these models is the importance of a high strike velocity to exploit more fully the hydrodynamic penetration mechanism, which, in turn, is further improved by the use of longer penetrators having higher densities relative to the target material density. This is amply supported by experimental work. Shaped charge is indeed an extraordinary phenomenon that is beyond the scale of normal physics, which explains why its fundamental theoretical mechanism is by no means fully understood. 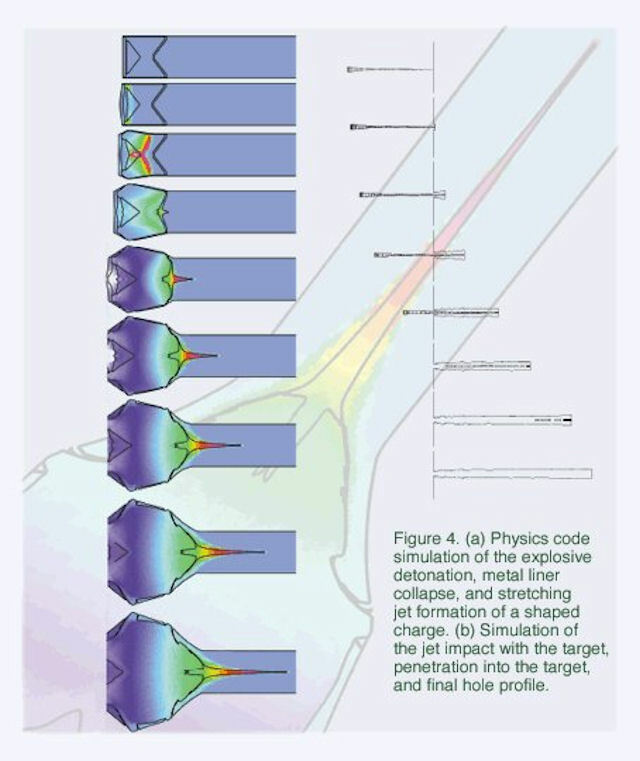 The shaped charge jet tip reaches 10 kms-l some 40 µs after detonation, giving a cone tip acceleration of about 25 million g. At this acceleration the tip would reach the speed of light, were this possible, in around 1.5 seconds. But of course, it reaches a terminal velocity after only 40 millionths of a second. It is difficult to think of any other terrestrial event as fast as a shaped charge jet tip. The jet tail has a velocity of 2-5 kms-l and so the jet stretches out to a length of about 8 cone diameters (CDs) before particulation occurs. The stretching occurs at a high strain rate, requiring the cone material to have excellent dynamic ductility at temperatures up to about 450°C. On reaching a target, the pressure developed between the jet tip and the forming crater can be as high as 10 Mbar (10 million atmospheres), several times the highest pressure predicted in the Earth's core. It is universally agreed that conical liner collapse and target penetration both occur by hydrodynamic flow. However, it has been established by X-ray diffraction that the jet is solid metal and not molten. Additionally, best estimates of jet temperature by incandescence colour suggest a mean value of about 450°C, and copper melts at 1083°C at atmospheric pressure. So the following conundrum is the first confusion: The jet appears to behave like a fluid, and yet it is known to be a solid. One recent theory that would help explain this is that the jet has a molten core but with a solid outer sheath. The hypervelocity hydrodynamic impact (unlike lower speed KE penetration) results in a mushroom head penetration, such that the hole diameter is larger than the penetrator diameter. The dynamic compressive yield stress of the target is exceeded by a factor of at least one thousand times, so that only the densities of the target and jet materials are important. Both materials flow as if they were fluids and the penetration event can be modelled quite accurately using the Bernoulli equation for incompressible flow to give the well known hydrodynamic penetration equation.